Junior Luke Juergens secured a fellowship ran by a venture capital firm in Silicon Valley, a competitive program that accepts only 3 percent of its applications. This summer, one junior and computer science major will move from the city of political junkies to the nexus of techies for a dive into the world of startups. Luke Juergens won a competitive engineering fellowship earlier this semester, run by a venture capital firm in Menlo Park, Calif. The program, which accepts just 3 percent of its applicants, pairs undergraduate and graduate students with startup companies in the firm’s portfolio, exposing fellows to the heart of the tech industry at hands-on jobs, and through networking opportunities at events and programs led by local executives and CEOs. Kleiner, Perkins, Caufield and Byers, the firm that runs the summer program, looks to show fellows the nitty-gritty of the industry. As someone who’s only traveled along the East Coast, Juergens said he’s looking forward to spending time in the country’s technological hub. A native of Boxford, Mass., a “really small town” near Boston, Juergens dates his desire to problem-solve and figure out what makes things tick to his early childhood. “Because my dad is a carpenter, he would always have tools lying around. And if they’d ever break, I’d be taking them apart, saying, ‘Daddy I can fix them for you.’ Obviously, that never went how I expected, and there would be grease everywhere, but I always wanted to try,” he said. 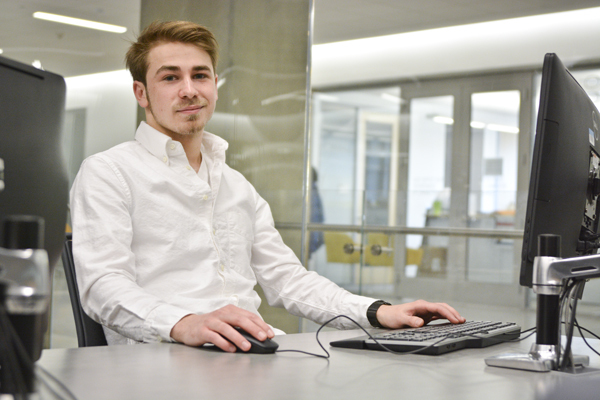 Since the start of his sophomore year, Juergens has interned as a junior developer at Social Driver, a digital marketing services agency where he focuses on web and software development. He said he’s bringing his experience at Social Driver to the U-Shaped region of tech companies stretching from Oakland to San Francisco, which houses top tech companies like Apple and Facebook. “Silicon Valley is the birthplace of so much. I remember in high school, and even before that, I always wanted to work [there]. It almost feels like making it,” Juergens said. Juergens gained some experience with computers in middle school, but it was during high school that the hobby shifted to a career path and he started enrolling in computer science classes every year. Juergens said he likes working with computers because he can create content without facing massive costs if plans change. During the KPCB fellowship, Juergens will work for Shape Security, a network and information security startup that aims to prevent cyberattacks by continuously changing what hackers are targeting. The company is a big jump from Social Driver, and Juergens said his new work would be more dynamic than what he’s done before. He said the move beyond the fundamentals will allow him to focus on his biggest concern: Making the Internet safer to use. He said he was looking forward to learning best practices from the people at Shape Security who combat cyber-security problems every day. “Because if you’re doing something, why even bother if you’re not going to do it the right way?” he said.